Opening Sentence:At 10 a.m. the street was empty. Synopsis:It is 1915. War is being fought on a horrific scale in the trenches of France, but it might as well be a world away from sixteen-year-old Midge Macpherson, at school in England learning to be a young lady. But the war is coming closer: Midge’s brothers are in the army, and her twin, Tim, is listed as ‘missing’ in the devastating defeat of the Anzac forces at Gallipoli. Comments:This book is aimed at a young adult audience, but I think it will find many fans amongst the adult population as well. 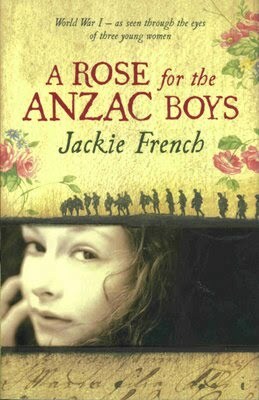 Jackie French has extended her, not inconsiderable, talent in order to truly bring the first world war to life. The horror and bewilderment of people experiencing trench warfare for the first time are expressed well and we find ourselves immersed in the lives and minds of her characters. This is one of those books that makes a real emotional impact and will live on in your memory long after you have read it. I can’t think of a better book to introduce the topic of World War One to the younger generation. ‹ Yes to Female Circumcision?